Let’s review a time line on this project. November 2014. 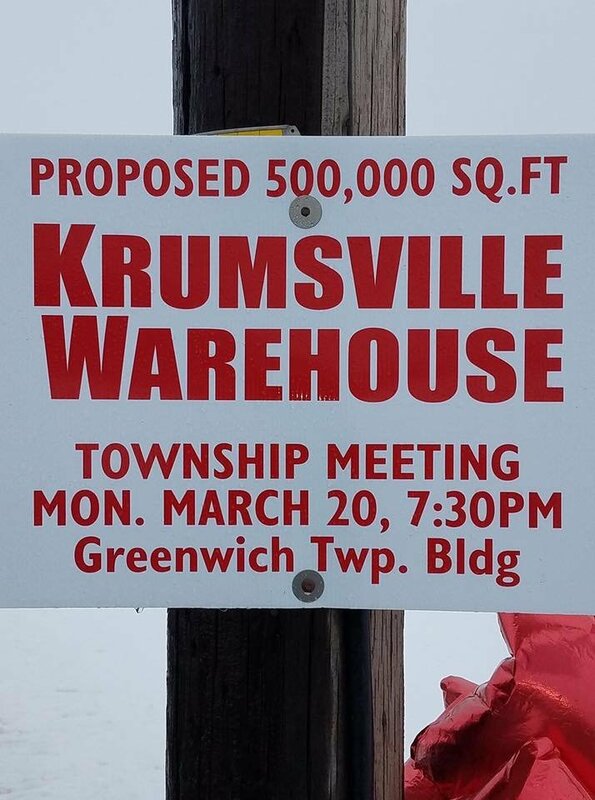 Developer approaches the Chairman of the Board for Greenwich Township regarding building a warehouse in Krumsville. 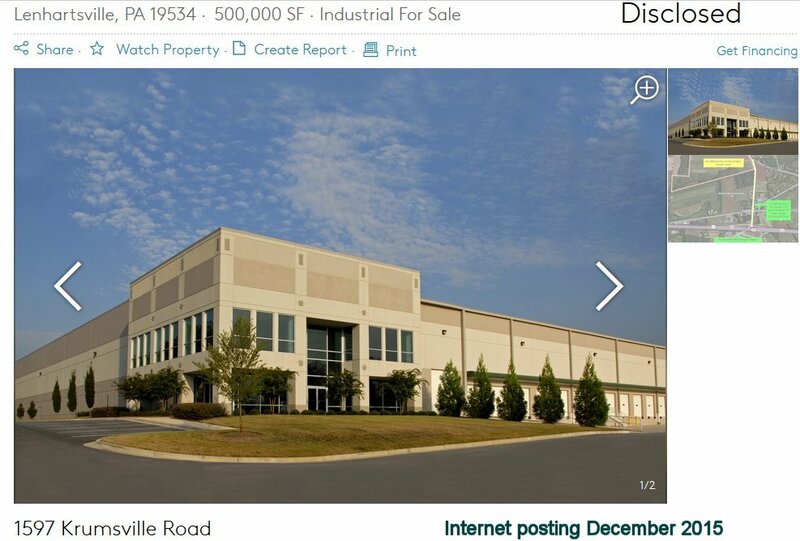 There is industrial properties north of the town available. Negotiations are started with the land owner Ken Thompson and the developer posts this information on their website. November 2015. A letter is sent to Chairman of the Board requesting a meeting about submitting plans to build a warehouse. They are looking for approval before entering into negotiations to purchase the land. December 2015. 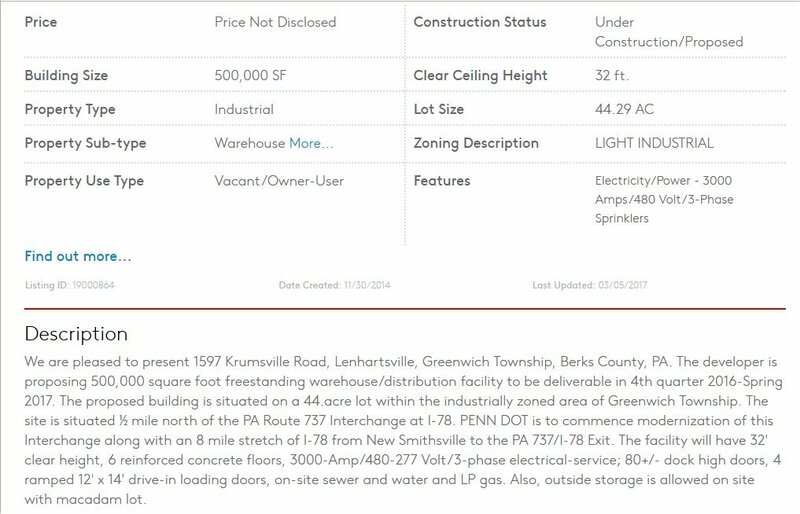 Developer posts this information on their website and presents a concept sketch plan to Greenwich Township. March 2016 – Developer revises sketch plan and updates website advertising adding additional bays and parking lots to the description. April 2016 – a local Greenwich Township resident Matt Brett asked the Chairman of the Board if a warehouse was being built on Route 737. The Chairman responded that it was a rumor and there were no warehouse plans at this time. July 2016 – Technicon is fired as Greenwich Township Engineers (they remain on until year end to complete any outstanding building permits, zoning issues and subdivisions) and Chris Noll from Keystone Consulting begins. Sketch plan is officially submitted for engineering review. December 2016 – Chris Noll states he will formulate a list of concerns regarding the traffic plan for the Crossroads X Project. At the December 28, 2016 Close-out Year meeting, Chris Noll gave the Chairman of the Board a letter for PennDOT regarding the Crossroads X Warehouse project. The Board will review the letter and make any necessary changes before sending it to PennDOT. January 2017 – Board approved the Crossroads X Traffic Study letter to be sent by Chris Noll to PennDOT..
March 2017 – property sale is closed between Ken Thompson and Crossroads X, LLC. March 2017 – Chris Noll announced that the revised sketch plans were received on February 15, 2017 and will be reviewed at the Planning Commission meeting on March 20th. Residents are just now finding out about this warehouse project, and Krumsville gets some signs posted. NOTE: The March 20th Planning Commission meeting had over 200 residents in attendance. It was a free-for-all. This was when I got involved. September 2016 – A most recent dumb-dumb move by the developer posted here. Ad for Warehouse that isn’t even approved at this time.